Introducing The Dressage Foundation Representatives - Keeping us close, to better serve the dressage community where you live. More Representatives to be added soon. Thank you to all our volunteers! These volunteer representatives are available to provide information about TDF, and to keep TDF informed about dressage in your state. If you'd like to become a TDF State Rep, or know someone who might be interested, please contact Jane Fucinaro at jane@dressagefoundation.org. 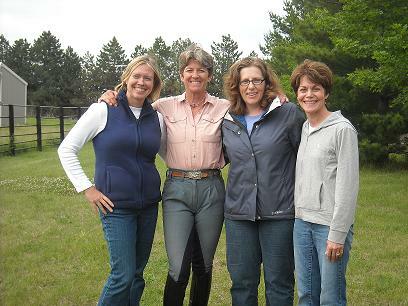 Nebraska Representative Heidi Helmer (third from left) with Tara Nolan, Sarah Martin, and Karen Stricklett (l-r).